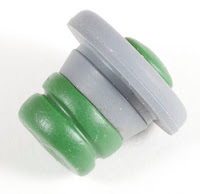 The problem with stoppers like these is that clay does not stick to them well. Also, they tend to fall out if a heavy top is placed on them. Here is a method to make them work a little better. It sounds complicated, but it really is quite fast. Place the piece of wood on the floor or a very sturdy table; place the stopper on the wood with the top of the stopper down; center the punch in the inner ring of the stopper and whack it a couple of times with the hammer. Roll out a snake of clay about the diameter of the inner ring of the stopper. 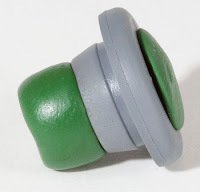 Taper one end so that it is small enough to fit through the hole in the stopper. Insert the narrow end of the clay through the stopper from bottom to top. While holding the clay firmly in the stopper, mash down the narrow part on top. You can spread it out as wide as you want. Just don’t disturb the core of clay going through the hole. Trim the bottom part of the clay to about 1/4 inch. Make sure the bottom part of the clay is the same diameter as the inner ring of the stopper. Insert it into the bottle to make sure it will fit, but DO NOT put the stopper all the way in. If you do, you will tear the inner clay core when you try to take it out for baking. You can stop here, but you can make one additional enhancement if you wish. Use a needle tool to make a channel around the bottom part of the clay. After the stopper is baked, place a tiny rubber band in the channel so it will act as an O-ring. You will have to wrap the rubber band twice to make it tight. The tiny rubber bands can be found in a dollar store in the hair accessory section. You will have to experiment a bit to find the proper size for the channel. You can bake before decorating the top or after. The clay you put on top will now be anchored to the stopper by the core of clay going through the center. 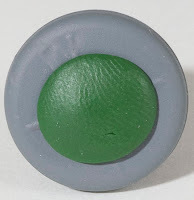 If you bake before decorating, use liquid clay to make the new clay stick to the button on top. Let the stopper cool thoroughly before trying to insert it into a bottle. If the clay is warm, you can tear the inner core by trying to pull it out. 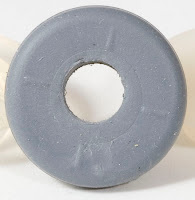 I was prompted to post this entry after reading a discussion on Polymer Clay Central where Desiree showed how she makes narrow skinner blends using little magnets. I solved the same problem slightly differently. I like to make narrow Skinner blends too so I recently bought a curved magnet from Sue Kelsey and covered it in clay. The magnet is great but it won't stay in place when I'm trying to make a very narrow blend, perhaps because I covered it too thickly. Anyway, to keep it where I want it, I made some spacers out of clay. 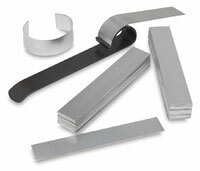 With the one inch, half inch and quarter inch spacers, I can make any width strip in quarter-inch increments, with or without using the magnet. At the thickest setting, roll out some scrap clay the full width of the pasta machine and about 5 1/2 inches long. Trim ends and roll into a snake which will be the width of the pasta machine. On one side of the snake, pinch a ridge as if you were making a tear drop shape. 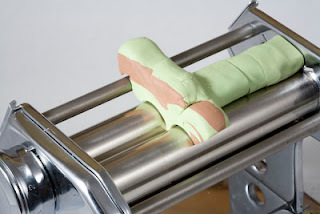 Cut squares of plastic wrap the width of the rollers and wrap both rollers so the clay will not stick. You don't want to distort the clay when removing it. With the machine set to #4 (a middle thickness), put the ridge between the rollers of the machine and press the clay down firmly. You want to shape it to the rollers. Remove the clay carefully and put it into the freezer to firm it up. Trim one end as straight as possible and then cut the clay into 4 one-inch-long segments, one half-inch segment, and one quarter-inch segment. Make the sides as straight as possible. I cut through the narrow ridge first and then down through the rest of the piece. Bake with the pieces lying on their sides. After reading Desiree's tutorial, I decided to make a long guide piece to use on my machine that does not have fenders. It ain't purty, but it works. I've been on another Bottles Of Hope craze. These ladies remind me of the Easter Parade in New York City.